Classfare – Black, Brown, or Chartreuse? Keep your pants high and your style higher with a functional and funky belt. While socks have been many men’s go-to accessory for adding color and pattern to otherwise simple outfits, a unique belt is a fun and arguably more interesting way to spice things up (especially when going sockless during the summer months). Every guy already has a black and brown leather belt (including yourself, yes?). But what about teal? Or green? Or some a playful pattern? Whether they’re peeking out from under an untucked polo or brandished boldly for the world to admire, this the easiest way to wear that punchy pattern you never thought you could pull off. Add an Americana-inspired finish to any ensemble with this webbed-cotton belt from Ralph Lauren, featuring a bandanna-print overlay and leather trim. Assembled in the U.S. of A. with an old-school Western vibe, this belt from Brooklyn-based Camp Hero is hand sewn with a whipstitch and hand beaded with a firebird design. Robert Graham is known for making aggressive statement shirts. He’s lesser known for making great, classic accessories with a twist. Like this belt, crafted from velvety nubuck leather in the summery and soft hue of teal and featuring bright yellow stitch. Another goody from the man who does color so well. 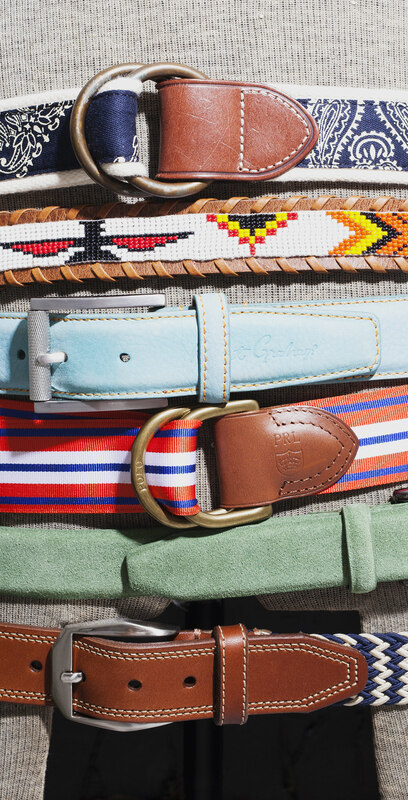 Designed with rugged leather trim, this sporty belt by Polo Ralph Lauren features timeless stripes, perfect for summer. This genuine suede belt by Johnston and Murphy gives any summer look an assertive pop of color. Available in 6 colors. 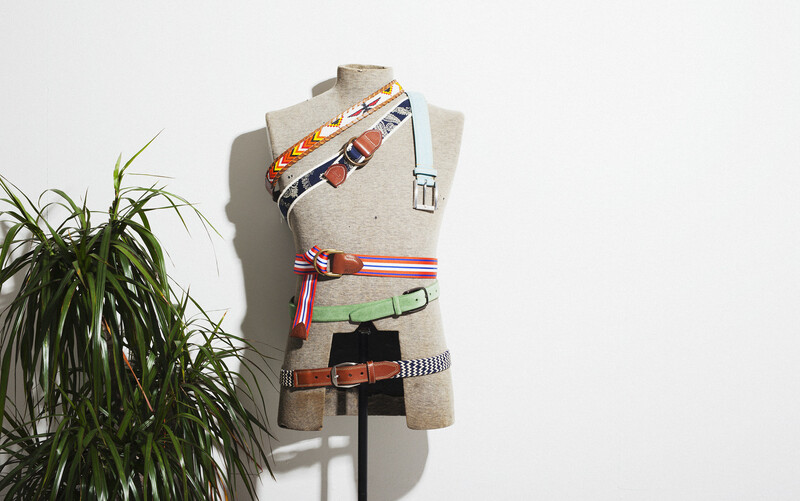 Stretchy cords are tightly plaited together, fashioning this handsome belt from Martin Dignman. It’s finished off with tumbled bridle-leather tabs and sculpted silver-tone hardware.